March Madness sounds like a gross flu one would not want to catch to innocent, non-sports fanatics. To others this is the golden crown of all fantasy sports competitions. Horse racing has the Triple Crown Racing Series, while middle age men and frat boys aplenty have March Madness. Ever wonder what all the fuss is about those daunting brackets the office? Everyone frantically filling one out to see who will be the supreme predictor of the office pool. Yup, those pesky or extremely exciting pieces of papers are now back in action. For those who play, bragging rights, money, and even hairstyle changes or other ridiculous bets are on the way for 99 percent of players. At the end of all the busts, upsets, and buzzer beaters will be one glorious winner out of the many who enter the bracket battle. “Wait, my team made a tournament, but it is not that one”. Do not worry there are only seven different tournaments happening at the same time with 24-68 teams in each one and all over the country. Confused yet? You are not alone, let us explore it together. It is the “grand-daddy of them all” as one might hear on a Cheyenne Frontiers Day commercial right about this time of year. This is the biggest tournament and the one everyone will be talking about at the office. Founded in 1939 by the NCAA. Bracket Style: The last eight invited play for the last four competitive seeds for a chance into the tournament. Once that is decided, a 64 seed single elimination bracket play is started. When does it happen? : March 19 and 20 are for those last play in games to happen and the tournament proper starts on March 21. Starting on March 21, there will be two extended weekends of basketball to be played Thursday through Sunday. April 6 will be semifinals and April 8 will be the final championship game. This tournament is a solid marathon of three weekends of playoff basketball. Do fans stick through it all the way? Many do, but many also curse at their phones once an incredible upset busts their bracket and chances of bragging rights. If a team won their conference tournament, then they are automatically entered. If a team did not win their conference tournament then they must rely on their resume being among the top in the nation to get an at-large bid. Last year’s champion and runner-up: Villanova won and Michigan was runner up. We covered March Madness in greater detail because it is the largest and most popular tournament. The Metropolitan Basketball Writers Association founded the NIT the year before the NCAA tournament in 1938. Since then the NCAA bought the tournament and uses it as an experimental tournament for new rules. The NIT was historically played at Madison Square Gardens each year, but now semi-finals and the final are hosted there . How do teams get chosen: Second place in the regular season, regular season champions who lost in the conference tournament, and highest remaining teams. Last year winner and runner up: Penn State > Utah. NIT Bracket. View full size at NCAA.com. Founded in 2007 by the Gazelle Group sports marketing firm to increase competition among lower level schools. The CBI is made of lower half power conference teams and mid-major conference teams. How do teams get chosen: 16 teams are invited and bids are taken for who gets to host the home games. Cost to host: First round $35,000, Second round $50,000, Third Round $75,000. The last round is a championship series of best of three. The two teams alternate venue between the highest seed, lowest seed, and back to the highest if game three is necessary. Last year winner and runner up: North Texas > San Francisco. CBI Bracket. View full size atBleacher Report. This tournament is only for Mid-Major level men’s teams to compete in. Mid-Major refers to conferences that are typically a one-bid conference for the NCAA tournament and on the smaller side of Division I. According to College Insider they deem 22 conferences to meet this designation. The tournament began in 2009. How many teams are included in this tournament fluctuates according to budget, competition, and if the teams playing have the budget to pay-to-play. This year there will be 26 teams competing in the first round. The second round is the same except the top three seeds get a bye. Following that, the bracket continues as normal with the highest bidder hosting. Bids start at $30,000 to host a home game. Last year winner and runner up: Northern Colorado > U. of Illinois – Chicago. CIT Bracket. Photo via collegeinsider.com. The women’s version of March Madness is identical to the men’s minus the teams involved and amount of high caliber advertising. In 1981 the Women’s tournament had their first season as the NCAA Division I National Championship Tournament. Number one seeded teams this year: Baylor, Notre Dame, Mississippi State, and Louisville. Formerly the NWIT tournament from 1969 to 1996 has become the WNIT after new ownership and rebranding. Fort Collins company Triple Crown Sports rebranded the tournament and is now a 64 team bracket after the 2010 expansion. 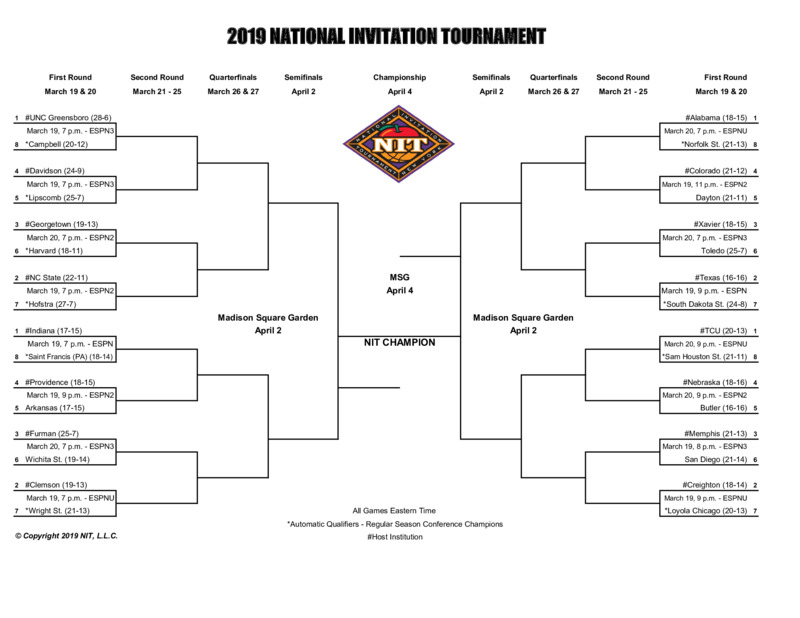 Unlike its seemingly similar male version the WNIT is more complex and overall bigger tournament. Home teams are strictly dependent upon which of the teams matched up bids higher to host the game. 32 automatic qualifiers from winning conference or placing highest in conference and not going to the March Madness get in first. Once 32 at-large bids are satisfied the committee then chooses successful and above .500 or better teams. Sports Tours International founded the WBI tournament in 2009. Similar to the WNIT, the WBI shares only a familiar acronym with the CBI. The WBI chooses teams based on their statistical resumes. Whoever are the best 16 teams left after the NCAA and WNIT choose, they get the invite to play in the WBI.